St John Ogilvie was a Jesuit priest, martyred for his faith at Glasgow on 10th March 1615. He is the only canonized martyr of the Scottish Reformation. The year 2015 is the 400th anniversary of the martyrdom of St John Ogilvie. John Ogilvie is born on 4th July at Drum-na-Keith, on the north east coast of Scotland . 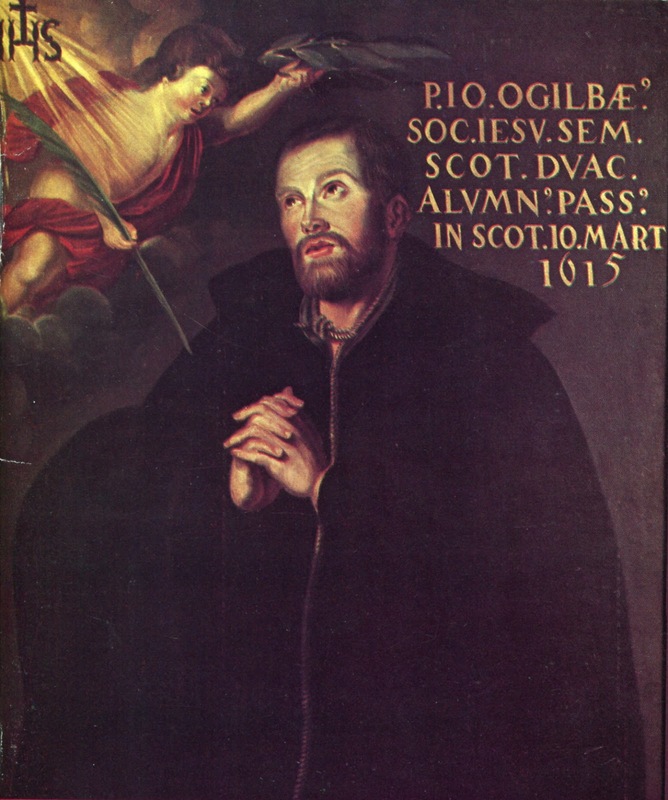 His father, Sir Walter Ogilvie, conformed to the state religion of Calvinism (established by act of parliament in 1560) and later known as Presbyterianism. His mother, Agnes Elphinstone, was a Catholic with two brothers in the Society of Jesus. John's mother dies when he is three. Walter Ogilvie is remarried, to Mary Douglas. Travels to Helmstedt (an illustrious Lutheran school founded in 1570) to begin his formal education, age 13. Enrols at the Scots College (which had moved from Douai to Louvain), undergoes instruction from Cornelius a Lapide SJ and shortly becomes a Roman Catholic. Then continued his studies at the Jesuit university at Olmütz (Olomouc, founded 1570) in Bohemia because of the poverty of the Scots College. Continues studies with the Benedictines at the Schottenkloster (Irish Monastery) Sankt Jakob, Ratisbon (Regensburg). Returns to Olmütz. Enters the novitiate of the Society of Jesus on 5 th November at Brno in Moravia. Takes his first vows as a Jesuit on 26 th December at Graz in Austria and then teaches grammar in the Jesuit school (founded 1573) while studying philosophy at the Jesuit university (founded 1585/6). Teaches grammar and humanities at Vienna (Jesuit college and university founded 1551). Returns to study at Olmütz to study theology. Appointed Prefect of the Sodality of Our Lady. Ordained priest at Paris and appointed confessor to the students of the Jesuit college at Rouen (founded 1593). Returns to Scotland, landing at Leith, under the alias John Watson, horse dealer. He is accompanied by James Moffat SJ and the Capuchin Franciscan, John Campbell. Ogilvie travels to London and on to France on a secret mission, seemingly under the protection of the King. He returns to Scotland in June. On 14th October, he is betrayed by Adam Boyd and arrested in Glasgow. Imprisoned and tortured for five months in Glasgow and Edinburgh. John Ogilvie is executed at the Mercat Cross, Glasgow, on 10th March and is buried outside the city walls. Ogilvie's Relatio (his own account of his arrest, imprisonment and torture, written in prison) is printed in various cities in Europe and circulated secretly in England and Scotland. The process to have John Ogilvie declared 'Blessed' is begun but not completed for another 400 years. 22nd December - Declared 'Blessed' by Pope Pius XI. 17th October - Declared a 'Saint' by Pope Paul VI. 400th Anniversary of the martyrdom of St John Ogilvie SJ. The feast day of St John Ogilvie SJ is celebrated on 10th March (the day of his martyrdom in 1615) in the Jesuit calendar of the British Province and in the dioceses of Scotland, and on14th October (the date of his arrest in 1614 and the beginning of his martyrdom) in the rest of the universal Church.